Request authorization to approve a Development Plan for 49, 51, 63 Melcher Street within Planned Development Area No. 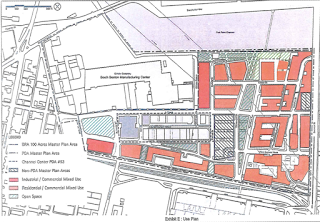 69, South Boston/The 100 Acres, consisting of office and retail space; to issue a Scoping Determination waiving further review of the Article 80 process; to issue a Certification of Compliance and a Certification of Consistency upon successful completion of the Article 80 process; to enter into a Memorandum of Understanding; and to petition the Zoning Commission for approval of the proposed PDA Plan. Request authorization to issue a Determination waiving further review of the Article 80 process for the construction of office, retail and restaurant space located at 316-322 Summer Street; to issue a Certificate of Compliance upon successful completion of the Article 80 process; to enter into a Development Impact Project Agreement; and to recommend approval with proviso, subject to design review, to the Board of Appeal for the various variances and conditional uses within the M-4 South Boston IPOD, Fort Point Waterfront, Groundwater Conservation Overlay District. Labels: BRA, development, Melcher St., Summer St.